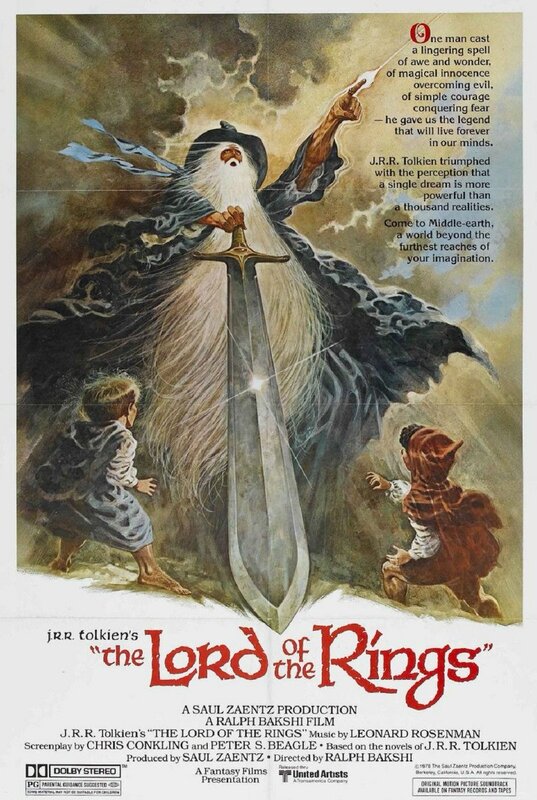 The biggest memory I have around this film is when I was younger and we were planning on watching it, a friend was tasked with renting it, but accidentally got a wrestling tape called The Lords of the Ring instead (maybe he had just called to reserve it, without seeing the box). I’ve always had mixed feelings for this film. I do find it to be quite interesting and fascinating, and it is a well done retelling (albeit unfortunately cut short) of the Lord of the Rings saga — and I was quite surprised to see how Jackson’s film does in fact follow so many of the same beats as this earlier film. Where I have mixed feelings is with the aesthetics. The character designs are great, but I’m not a huge fan of rotoscoping when it comes to animation — it gives everything too much of a jerky motion, since it maps too closely to realistic movement — and so would have much preferred a more traditional animation style. But what I dislike the most is that they in fact eschew animation a lot of times (maybe for budget reasons) and so you occasionally get real actors with a slight color overlay — often suddenly and with no transition — and that’s something I don’t like. Where it does slightly work is with the orcs, since it makes them look so creepy (but I would still have preferred to have them properly animated). Still an interesting film to revisit though.